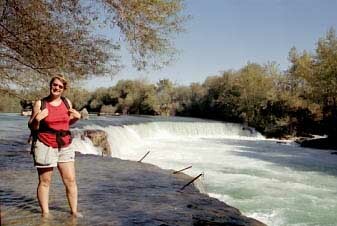 Near Side lies Manavgat, which has a small and a bigger waterfall. 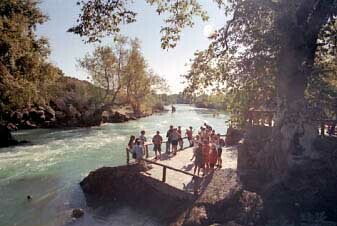 The small one is merely a rapid, but a boat-tour from Side has to stop here. 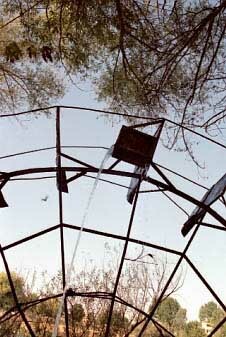 There are some waterwheels, with no obvious purpose. The big waterfall is nice. It is crescent shaped, and although it is not high, it is pretty broad. The water is at least at one side very shallow, so it makes a nice spot for a picture. Next to Leon is standing another photographer with his model, waiting for us to leave. It is a place with a lot of trees, providing with plenty of shadow. And there are some souvenir shops and places where you can buy a drink or something to eat. In the warm and rather dry surroundings, it forms and oasis. The countryside has a lot of agriculture. October is the time for harvesting. 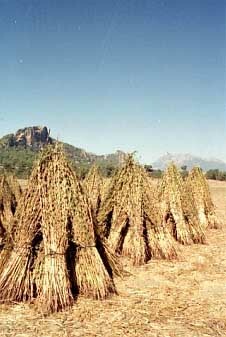 We saw a lot of these sheaves, probably of the peas used for making hummus.